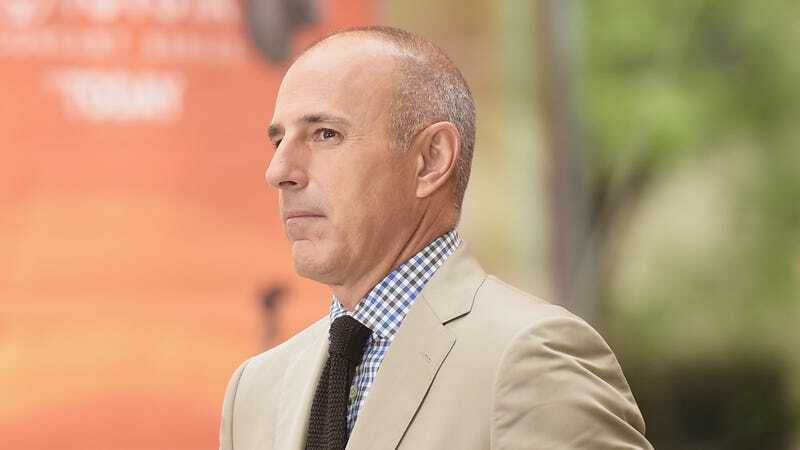 Following the multiple allegations of sexual harassment and misconduct against America’s most charmless morning show host Matt Lauer, NBC has reportedly revamped their anti-sexual harassment rules in an attempt to nip any further inappropriate behavior in the bud. According to a source that talked to Page Six, the biggest change to the rules is that all employees are now required to report any “inappropriate relationships” they see—a workplace version of “if you see something, say something,” if you will. Furthermore, employees who see something and do not say something could be fired for not “snitching” on their colleagues. “Romantic relationships at work are not exactly unusual, but now NBC says it is taking a zero-tolerance approach. Staffers have been told that if they find out about any affairs, romances, inappropriate relationships or behavior in the office, they have to report it to human resources, their superior or the company anti-harassment phone line. Staffers are shocked that they are now expected to snitch on their friends. The rules also reportedly include stipulations about sharing cabs with coworkers (don’t do it) and taking vegans to steakhouses (also don’t do it). What most companies have yet to figure out about rules is that they’re not a solution to the problem —issuing a series of proclamations after something messy and ugly has come to light is the same as a limp apology. Technically, these rules are meant as a course-correction for the future; maybe they should’ve have always been in place, but even if they were, no one would have followed them. Rules that are so ridiculous that they’re leaked to Page Six and presented as gossip are rules that will immediately be broken. A culture that allows for rampant sexual harassment and misconduct to happen in the workplace for years and years will not be changed by preventing one coworker from sharing a cab with another. NBC’s trying their best, but sexual harassment and misconduct aren’t workplace-specific issues—they’re systemic and a part of life for anyone working in any job, in any field, across the board. Sexism is institutional! Rules won’t fix it. Common decency might.